Literary trails to guide you through an unknown Prague. In the autumn of 2011, in agreement with conservationists and City Hall, several short excerpts from the works of Czech writers were written on well-known locations. 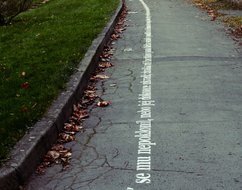 The hundred metre long texts were placed in relation to an author or the work’s relation to the location. Part of the trail was the PCL logo, an QR code and a mobile page.